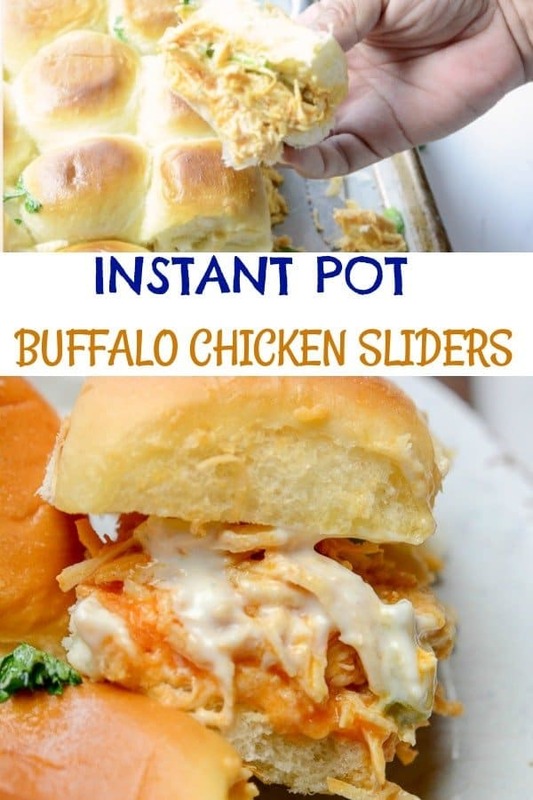 These Instant Pot Buffalo chicken sliders are the perfect game day food to serve up to guests, or a quick and fun dinner option to change things up at the dinner table. Instant Pot Buffalo Chicken Sliders are tender pulled chicken with a blue cheese hot sauce that is the perfect mix of spice and a splash of sweet. 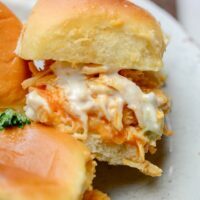 The Instant Pot makes these buffalo chicken sliders a breeze to cook, and the flavor factor is phenomenal! This summer has been a blast; we have been spending so much time outdoors enjoying the warm sunshine, dogs playing in the yard, and just the sounds of summer. But, I have started to see the leaves begin to go from deep green to a lighter shade of green to yellow. I have heard fall is coming early this year, so I am getting my favorite dishes ready for fall weather. 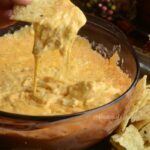 With fall comes football season, and we all know we can’t go without some game day foods! 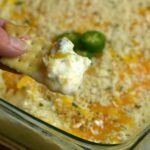 You may also like my Crack Chicken, Buffalo Ranch Chicken Dip, or my Jalapeno hot popper dip, All done right in the instant pot. 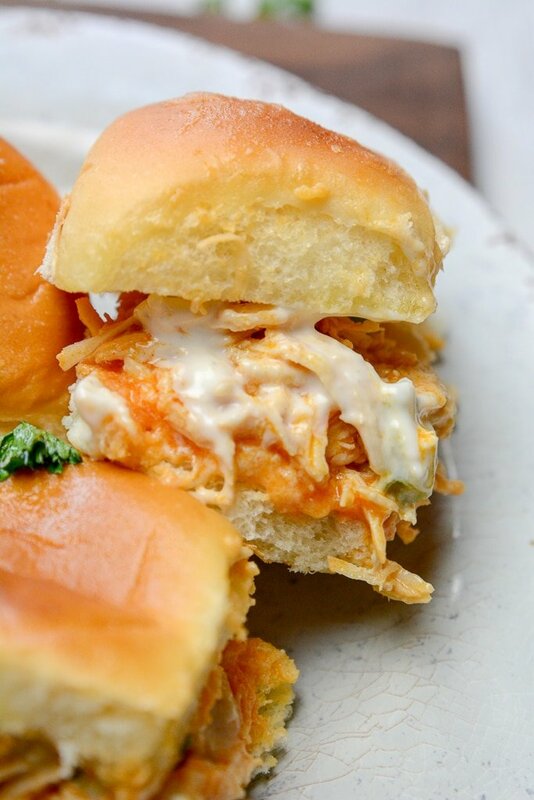 These Instant Pot buffalo chicken sliders are the perfect game day treat to serve up your guests. Perfect size to grab and munch on as you root for your favorite team to win that touchdown that changes the game! Pair with all your other game day appetizers, and you will have a feast fit for a king on your hands. But, I don’t just limit these just for football season, I do make these chicken sliders throughout the year, and they are always a fan favorite. If you are going to be in charge of hosting a game day party, let me share some of my excellent stress-free tips to make your party a blast but also simple for you! Don’t stress and miss out on all the fun, let me help take the stress away with these tried and true tips! Take time to plan out your menu, drinks, supplies, etc. That way you have everything laid out that you know you need to do. I like to do decorations the night before a party, so it is one less thing to do the day of. Have your list written out so that you can mark items off as you finish out the tasks. This helps you to not forget a vital dish to make or task. Prep is one of the biggest things I can tell you. Create sides and appetizers that can be made ahead of time, so it leaves you with less work the day off. Cut up any vegetables and ingredients, so it drops the prep time down for the day of. 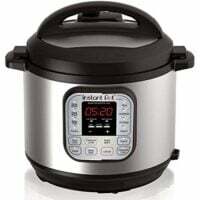 I also use my Instant Pot, slow cooker, and more to help free up the stove when cooking. Maybe make a slow cooker dip, so you toss in and forget it, or these sliders that take minutes to make. 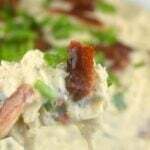 Then make a few cold dips or appetizers that you can make and just unwrap and set up when the time gets closer to party. If you are overwhelmed, don’t be afraid to ask for help. No one will think less of you, and you will find the day is a lot easier to tackle. Whether you host a potluck party, where friends and family chip in with snacks and food, or they come and help prep and get things ready for the party. Make sure to look around and plan where will everyone be sitting at, where to set up the drinks and food area. How many tv’s will be going with the game on. Try to really get a picture of what you need in terms of seating and space. This helps a lot so when the day rolls around, you have things lined up and you can delegate if need be. What is your best game day party tip? Place chicken, Wing sauce, water and brown sugar in the Instant Pot. This recipe was super easy and oh so good, I made it for my family and everyone loved it. Very good! My picky son even liked it! !